During the closed-door gathering, Clinton aides reportedly griped about the paper’s coverage of the potential 2016 candidate, arguing that Clinton has left public office and not be subjected to harsh scrutiny, according to a source familiar with the discussions. “We are not going to comment,” said a Times spokesperson when contacted by the Free Beacon. Reines and another spokesperson for Clinton did not respond to request for comment. Later this month, Clinton is scheduled to participate in a “network televised town hall” moderated by CNN correspondent Christiane Amanpour at the Newseum in Washington, D.C., Politico reported. We already know that Hillary Clinton is extremely ruthless. Greater attention should be paid to her animosity even to the left-leaning press. The true media profile of Hitler was that he was an extremely effective propagandist, nearly to the extent of something like "The Mule" in Isaac Azimov's "The Foundation Trilogy", a nearly psychic manipulator of public opinion. A dedicated sci-fi story that explored the issue of Hitler's extreme public relations effectiveness is Murray Leinster's "The Leader" http://www.gutenberg.org/files/23612/23612-h/23612-h.htm . Media Studies guru Marshall McLuhan used Hitler's extreme effectiveness in the use of the then-new medium of the public address/loudspeaker system to demonstrate the power of media to influence public opinion. When Msgr. Robert Hugh Benson, son of the Archbishop of Canterbury, wrote his apocalyptic "The Lord of the World" in 1907 http://www.gutenberg.org/ebooks/14021 , he could conceive of the Vatican being destroyed by aircraft ("volors", flyers), but he was unable to envision public address loudspeakers when he has the Anti-Christ, Julian Felsenburgh address crowds at "Paul's House" (St. Paul's Cathedral) in London. Felsenburgh emerges as the despot's dream, a propagandistic paragon, single-handedly turning the civilized world to obey his slightest whim by force of personality, rabid mob devotion. "Clinton advisers Philippe Reines and Huma Abedin, as well as Times Washington bureau chief Carolyn Ryan and national political reporter Amy Chozick,"
Young and old lady lumps fest, the mark of a Hillary sit-down. The only thing missing was the Pellicano enforcer. Geez Louise, is Hillary a big baby or what????? She’s supposedly so rough and tough. Will handle 3 am phone calls and deal with a crisis. Against this backdrop, she is whining about some bad coverage in the media???? Really????? She’s tough enough to be president, but not tough enough to handle the New York Times criticism?????? 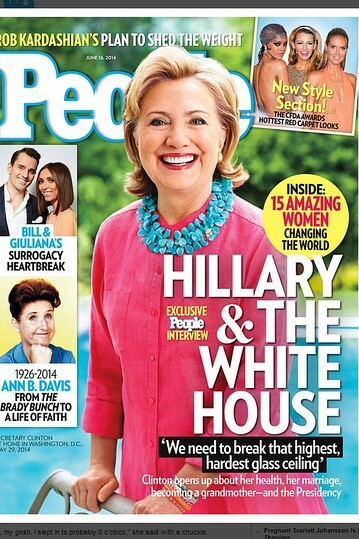 Did you see her People magazine cover? They have her in pink with a walker, next to Alice from the Brady Bunch and the evil photoshopped from her face. Going right for the jugular of the female vote "Oh she is just like my grandmother, she is for women and the children!". We also have a right to opine upon and criticize any politician, Your Thighness. Marjory Margolies Mezvinski belong in prison for the fraud, self enriching charity she runs which uses government grant money to fund her lifestyle. At least Ed was honest enough to be a bonafide criminal. A secret meeting with the press. Say that out loud a few times. “A secret meeting with the press.” Since she’s out of office she shouldn’t be subject to scrutiny? But she has never been out of the public eye. Doesn’t that make her an object of scrutiny? I mean, my goodness, just this list of awards and honors says she’s not only a public figure, but a radiant light of the western world. Certainly somebody with this much publicity can’t possibly complain when people write articles about her. Can she? I always thought they should do away with waterboarding and use that speech instead to get terrorists to talk. Imagine listening to that for 24 hours straight. One playing of it and I’d give up my mother. And make up some stuff about her. ... arguing that Clinton has left public office and not be subjected to harsh scrutiny, according to a source familiar with the discussions. Between the damage she has wreaked, and the questionable motives behind the incompetent actions, there are a lot of questions I'd like answered. I'm sure there are many others with similar desires, and even more questions. 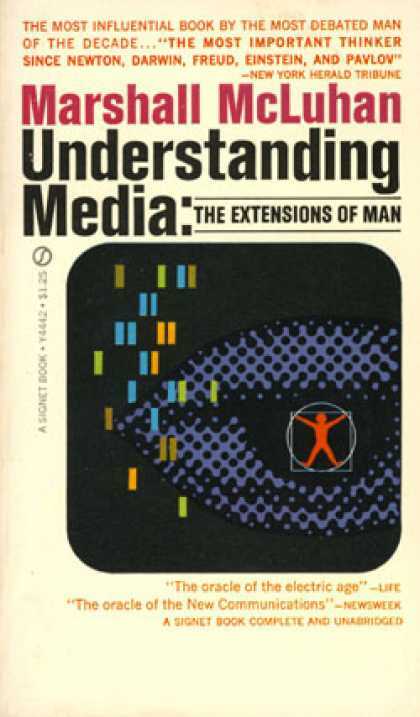 Marshall McLuhan predicted something very much like the internet (WWW). I wonder what his take would be on our tightly controlled MSM and the anarchy of the internet. How much longer can the government allow the relative freedom of expression of the internet to persist? For heavens sake, it’s a patio chair - not a walker. I can’t stand her any more than the next person, but get it right. Yes, and if it’s a lawn chair, she appears to be holding for “dear life” onto it! I got a kick out of the title above her head, “She needs to shed some weight”, but speaking of Kardashion. Photo shopped on the People cover was her fit figure. No way was that a current photo without trimming her heft considerably. It's my opinion that that is exactly why the media has shifted to be so liberal and biased. They see it as their mission to be the equalizer to the internet. That of course only promotes their doom and irrelevance, but that is their duty. Hey Hillary, thong, bikini, or commando? I mean that was the stuff of the Bill Clinton campaign. "Walker" was exactly my first thought. Eh, granny, ya gonna run for presydent? Better sit down and rest up a bit first.